If you travel a lot for business, you probably know this all too well and have your own set of tips to avoid overly wrinkly outfits — pants especially. I’ve tried rolling my pants, using a travel iron, and the old hang-while-you-shower trick. My favourite trick of all however is to buy trousers in smart fabrics. We’ve come a long way in terms of “performance” fabrics and more suiting companies are using sportswear technology and more sportswear companies are designing for everyday life. To help you out, here are my five top brands for wrinkle-resistant trousers, in black of course. I love Everlane trousers because they are the perfect wool blend. Naturally, I was intrigued when they launched a special version of their trousers in a wrinkle-resistant fabric. The GoWeave™ yarn is “tightly spun in Italy, creating a wool twill that is wrinkle-resistant and astonishingly smooth”. Not bad for winter jet-setting. These pants are nothing special, but what I love about some of the low-end brands like Zara and H&M is, believe it or not, their use of polyester. Viscose is a drapey fabric that has more give as well as being easy to toss in the wash.
A modern (or vintage, however you want to see it) take on a classic trouser. The slightly oversized pleating and cropped ankle are super cool and breezy, while the fabric is working overtime. Kit and Ace works with wonderful cashmere blends and have designed their own travel-optimized Ontace™ Suiting with 84% wool, 6% spandex, 5% cashmere, 5% silk. Trust Lululemon to make a pair of track pants look good. If you’re not heading straight to a boardroom from the plane, but still want to look smart, try this Trek trouser made of water repellant “urbanite twill”. Another synthetic pick with a composition of 82% triacetate and 18% polyester. 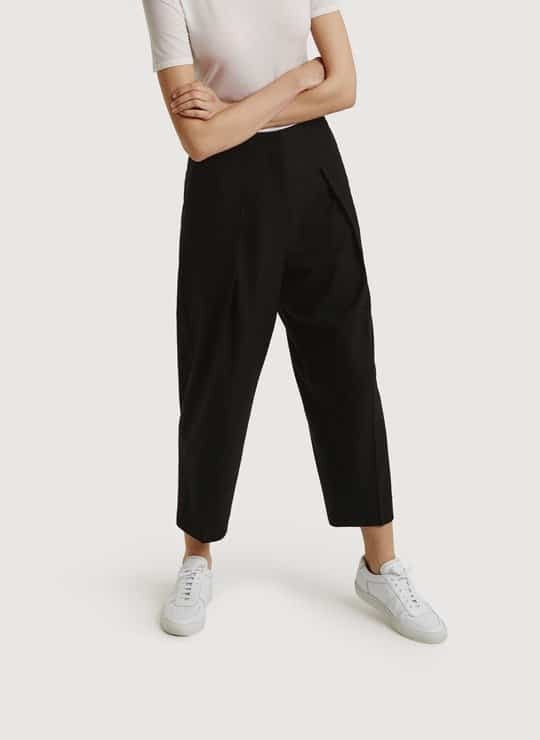 These pants are great for long-haul flights with their elastic waistband and slight give in the leg.